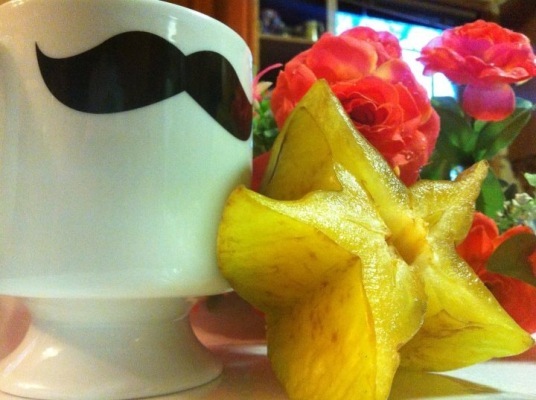 Averrhoa carambola or more commonly known as the starfruit, is a very unique type of exotic fruit from Asia, home to many exotic organisms. Not only is it extremely flavorful and succulent, it also a relatively unheard of fruit, especially if you are not leaving in the nice warm tropical regions of the globe. It is referred to as the starfruit because if you take a knife and cut a cross section of its' most widest region you will find that true to its' name the shape resembles a star. The starfruit comes in two flavors, sweet and tart. I have only every tried the sweet and I find that it taste like a mixture of an apple and pear. Carambola is now making name for itself here in the states, it is highly sought after the demands for this fruit have influenced cultivators to start growing them in areas such as Florida and California.